The Mississippi Department of Environmental Quality (MDEQ) recently accepted the City of Ridgeland as a Steward in its enHance program. Ridgeland is the first city to be named enHance member, and MDEQ is working to implement a pilot program to add other cities this year. enHance is a voluntary stewardship program that recognizes committed environmental leaders who accomplish goals beyond their legal requirements. enHance is open to facilities, cities, counties, and other entitites who are interested in the program, and applicants can choose from three tiers: Associate, Steward, or Leader. “We are pleased that Ridgeland has joined the enHance program, and they should be commended for their commitment to doing good work and their leadership. MDEQ is developing a track within enHance for municipalities to recognize their environmental stewardhip efforts and to provide a forum for promoting sustainable practices to all cities,” said Trudy Fisher, MDEQ Executive Director. Information about the program is available at: http://www.deq.state.ms.us/enhance. The City of Ridgeland developed and implemented the Environmental Management Plan to ensure stewardship of our environment and natural resources that current and future generations will enjoy. We believe that our strong neighborhoods, world-class schools and well-educated citizens embrace the conservation of our resources and many aspects of their environment. The City also will encourage other municipalities though the Enhance program by mentoring and assisting others in developing programs of their own. Most mosquitoes in Ridgeland breed and lay their eggs in standing water on private property. In order to protect you and your family from mosquito bites and potentially contracting West Nile Virus, you will need to do a little preventive maintenance. Emptying containers and other sources of standing water at least once a week will make a big difference in the number of mosquitoes around your home. Some of the more common mosquito breeding grounds include: gutters, low-lying areas, ornamental pools, bird baths, lawn ornaments, wheelbarrows, boats, empty plant pots and saucers, and tarps. The City of Ridgeland sprays for mosquitoes regularly throughout the mosquito breeding season. Spraying, however, does not completely eliminate mosquitoes. Following the advice in this article will help to significantly reduce the mosquito population around your home and in Ridgeland. For more information about mosquito control and preventing West Nile Virus, visit the Mississippi Department of Health website at www.healthyms.com. If you have a significant mosquito problem, please contact the Public Works department to assess your situation. For more information about Environmental Programs, contact Mike McCollum at 601.853.2027 or mike.mccollum@ridgelandms.org. Submit requests for action for code enforcement, maintenance, and more. View bid request details & submit project bids. Press releases, newsletters, and more. Meeting agendas and minutes from the Mayor and Board of Aldermen meetings. Access to various City permit applications, licensing, and Information. Access to City ordinances and codes. View various City maps and mapping resources. Fire, Police, and other safety resources. Resources for homeowners, renters, and future residents. 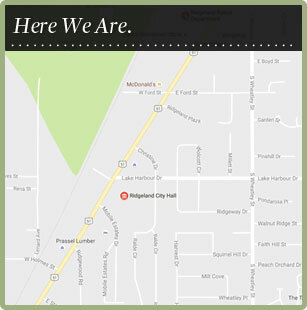 Click here for City of Ridgeland Job openings. City Hall will be closed on Monday, April 29, 2019.